Enter the school property from Severin Drive onto the driveway at the back of the building. Drop students off at the gate to the playground. After dropping students off, drive behind the back of the school and exit along the east side of the building. From 6:00 a.m. until 7:45 a.m., all students should be dropped off at the front of Mt. Helix Academy. They are to enter the main building via the east entrance and go directly to the Activity Center, Room 20. Because of the need to monitor student whereabouts, students who report to school after 8:00 a.m. must first report to the main office, check in as “present” for the day, and obtain a classroom admission pass. Drop off Jr. High students in front of the Jr. High Annex. Students are to go directly to their homeroom. 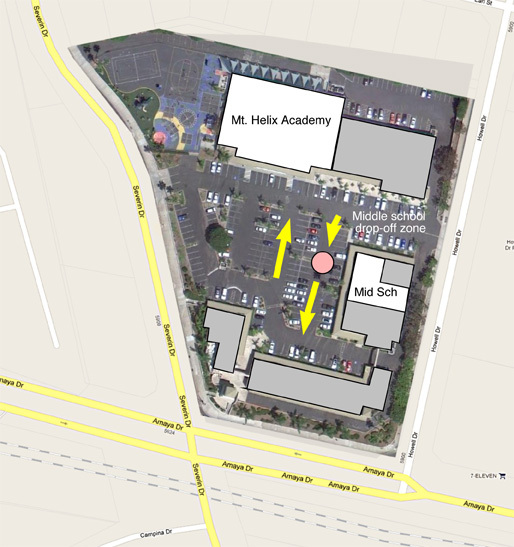 If it is raining at the time you arrive to drop off your child, please do so at the front entrance of the school. If it is raining and you are dropping your child off before 7:45 a.m., do so at the front entrance to the main building. If it’s after 7:45 a.m., Jr. High students should be dropped off at the Jr. High Annex.